Jeb got his start in 1999 with the Boise State Broncos. He got out onto the field as a Freshman and logged 10 receptions for 120 yards and 2 TDs from the tight end position. Considering the offensive wizardry that was employed at Boise St., Putzier was redeployed as a wide receiver from his Sophomore season on out. He topped his numbers fairly evenly each season, culminating in a Senior year with 44 receptions for 824 yards and 12 touchdowns when he was an All WAC selection. He finished his career on the blue tundra with 128 receptions for 2,050 yards, 16.0 YPR, and 19 touchdowns. The NFL reclassified Putzier back as a tight end, going into the 2002 draft. He did not receive a combine invite, but his fairly productive career at Boise St., coupled by his size (6’4″, 251) and well received team day (4.6 40), turned some heads of the scouts enough to get some attention. He was also valued for his special teams play as a long snapper. Jeb was tabbed in the 6th round, by the Denver Broncos as a ‘value pick’. He’d start off slowly and not even see the field consistently until 2004. He’d provide some nice mismatches, making 36 receptions for 572 yards and 2 TDs in 2004. (The 15.9 YPR was the highest number by a Bronco TE in over 25 years.) Putzier then followed it up in 2005 with a modest 37 receptions for 481 yards. With the Houston Texans making Denver Broncos offensive coordinator Gary Kubiak their head coach, Putzier signed with the team to replace Billy Miller at the position in 2006. The Texans however found Owen Daniels in the draft. While the position was retooled now with Daniels getting the majority of the snaps, Putzier ended up sharing time with Mark Bruener as well. He’d log 126 yards on 13 receptions. In 2007, he made 6 receptions for 39 yards, and 1 TD- a 7 yarder in a 38-36 loss to Tennesseee. After the season Putzier was allowed to sign with the Seattle Seahawks for 2008. There, he lasted about 6 games before resigning with the Denver Broncos, where he was cut in 2009. Jeb signed with the UFL Hartford Colonials, but was waved in June of 2010. 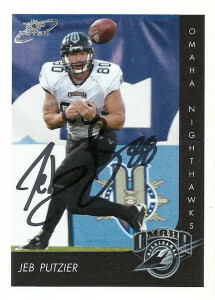 The Omaha Nighthawks picked him up, and he immediately fit right into the offense guided by Jeff Garcia. Putzier had 14 receptions for 144 yards and 3 touchdowns- which tied for the team lead. Of the 3 touchdowns, 2 were game winners against the Moutain Lions and the Hartford Colonials. Due to financial instability in the league, (namely players not being paid,) Putzier decided to retire after the season. Currently he lives in the Denver area where he has served as a guest on some of the local sports radio stations. A few things were going in Jeb’s favor for me sending a request out to him: 1) He’s a former Houston Texan, and 2) I did a UFL custom entry of him a few years ago for the Omaha Nighthawks. I really had high hopes things would take off, and as some fans had egged me on to do more cards I expanded off the base set and pushed the original UFL offering out to a bit over 100 cards. It became a labor of love when I lost out on a job in the industry I wanted, and I realized the league wasn’t going to make it. A lot of it to me is about preservation, and recovering that which is already forgotten to some. It’s just an added bonus when the player wants one of these cards to remember it by too, since a lot of them didn’t get squat from the league in the end. I didn’t honestly expect this one back, but lo and behold after a little wait, Jeb signed the TNT card, plus added one of his own, and asked me for a copy of my custom! With the recent flood of requests, I really have my work cut out for me!